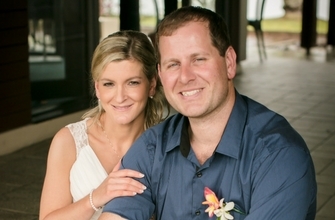 Hi my name is Jewel Brown and last year at the age of 30 I was diagnosed with Stage 3 Bowel Cancer. Looking back I had had symptoms of diarrhoea and cramps for about 6-7 years with stomach cramps that were unbearable at times. My doctors diagnosed me with IBS and I was prescribed with diarrhoea medication and told to go on a fodmap diet. I went on a holiday to America in July last year and picked up a staph infection in my toe, I was put on IV antibiotics but nothing worked to clear the infection. I then started started bleeding from my bowel and my diarrhoea was becoming uncontrollable, so I went back to the doctors and saw a different doctor this time who thankfully ordered stool samples. It came back with a reading of 500 for inflammation when it should read under 5!! From there I was referred for a colonoscopy and having private medical insurance this happened quite quickly. The colonscopy itself was very painful for me, I was sedated as is usually the case but had to have a second lot part way through as the pain was just unbearable. The specialist performing the colonoscopy found many small pre cancerous polyps but was also shocked to find a main tumour 8-10cm in length when he was expecting to find that I just had hemorrhroids. After the colonoscopy I had a lot of pain and also nausea which I wasn’t expecting, and I was also back in hospital twice to make sure my bowel hadn’t perforated. I met with the doctor at the public hospital in December and took my husband and mother in law along for support. I was told then that the tumour had a high chance of being cancer but they wouldn’t know until they operated on it. I then had two months of waiting and wondering over Christmas and New Years as my operation wasn’t scheduled till the February, I was in denial about what was happening and I thought there was no way it was going to be cancer. During my operation the surgeon took the lower half of my bowel and I had an ilesostmy bag for a month to allow my bowel to heal. It was a painful operation and an uncomfortable recovery, I was in hospital for 10 days all up. The following Thursday after my operation I was finally given the news that I had stage 3 bowel cancer and 2 of my lymph nodes also had cancer. Due to recent uncontrollable diarrhoea which resulted in a four week hospital stay and two rounds of blood transfusions, I have now had to stop my chemo otherwise my oncologist told me it could be fatal. I now believe that it’s a matter of me keeping up with regular tests to make sure there is no more cancer in my body. I wanted to share my story as before this happened to me I had no idea young people could get bowel cancer, I thought it was a disease that mainly affected the elderly and there is also no history of bowel cancer in my family. My doctor says he thinks the tumour had probably been growing 6-7 years, so I would have been only 23 at the time it started. I strongly suggest if you have any unexplained stomach/bowel problems to push your doctor for more tests, no matter how old or young you are.